How to book and shoot a Glamour Portrait studio session. John Riley and Paul Jones brighten the dark winter evenings with a Glamour Portrait studio session. John Riley checks out the Pentax M-series lens range. 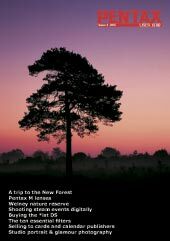 A look at the historical landscape of the New Forest. Success stories from make money in the card and calendar market. Roy Hampson shares some success stories in his quest to make money in the card and calendar market. While it’s easy to recreate many filter effects digitally nothing beats attaching an optical version, as Craig Roberts explains. Buying an *ist DS wasn’t straightforward. Buying an *ist DS wasn’t straightforward. When Jane Maude approached a major camera retailer the manager attempted to sell her a Canon instead! Photo opportunities at Welney’s Wildfowl and Wetlands Trust Reserve. David Robinson guides us through the photo opportunities at Welney’s Wildfowl and Wetlands Trust Reserve.